Last fall the Board of Trustees of the City University of New York voted to raise tuition by 5 percent in the Spring semester of 2011. This raised the cost of attending one of CUNY’s four-year colleges to over $5,000 a year including fees, a prohibitive amount for most working-class families. The Board held a public hearing on 15 November 2010 on the proposed budget and tuition and fee schedule. Students and teachers from around the CUNY system came to the hearing to voice their opposition. The BoT greeted them with a show of police force, and Chancellor Matthew Goldstein walked out on the “hearing” half way through. A week later these capitalist enemies of public education voted the tuition hike, plus raising the Fall 2011 hike to 5 percent. We reprint below the remarks of Kirstine Jungkurth, president of the Internationalist Club at Hunter College, who turned her back on the “Trustees”and instead spoke to the audience at the November 15 hearing. We are here to say: No tuition hike. Let me make that more precise: No tuition! Education is a basic demo­cratic right, but every year they’re making it more of an impossible dream. This new 7% hike – combined with additional charges and cuts aimed at grad students, the Black Male Initiative, ethnic studies and other programs – will make it even more difficult for poor and working-class students to stay in school. But that’s the whole idea – isn’t it? The whole point of the constant hikes and cuts is to make education more “elite.” This goes with the push by the Democrats in the White House and state government plus the Republican billionaire Bloomberg in City Hall to introduce more and more inequality in education. There’s a drive to privatize as much as possible to take the “public” out of public ed. So Mayor Bloomberg’s choice for new school chancellor seems to have just one qualification: she knows a lot about making big bucks and nothing about schools. Is that supposed to be the model at CUNY? Is the idea to turn it into Walmart U.? We say: No way – and we join with students and young people from Britain to California to Puerto Rico to Mexico to France in saying NO to capitalism’s cuts in education and social services. We need to join with transit workers facing cutbacks and layoffs, with immigrants, and the the whole working class which has the power to shut the city down in defense of our basic rights. Today at CUNY, students are dropping out of college or don’t apply because they can’t afford tuition and the costs of living combined. We say “No tuition – Open admissions,” and demand a state paid living stipend. “But what about the economic crisis?” say those who think it’s natural and right for those on the bottom of society to take the hit for the irrationality of the capitalist system. 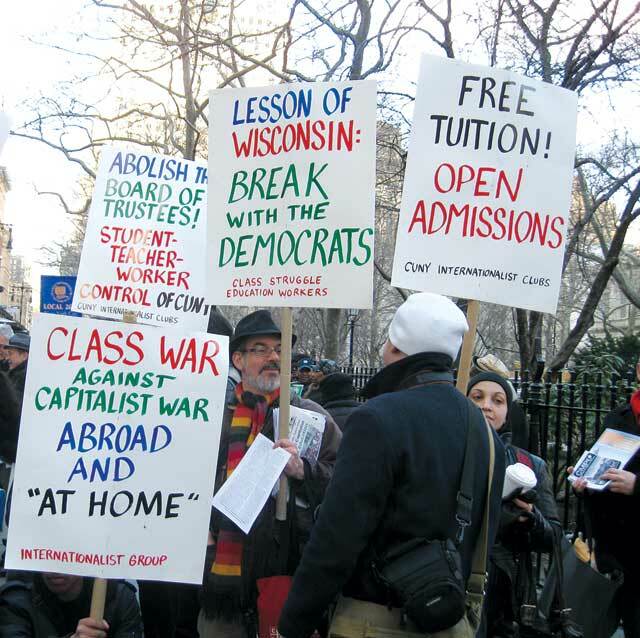 The fact is that free tuition existed at New York City’s public colleges beginning in 1847 and lasted through wars and financial crises, including the Great Depression. But ever since slavery, oppressed minorities were denied quality and equal education. In 1969, open admissions was won, allowing many black, Latino, working-class and immigrant students to go to college for the first time. With no tuition (and then relatively low tuition compared to today), and open admissions, CUNY graduated more black and Latino students than any other university in the history of the United States. It’s not surprising, therefore, that the ruling class took aim against these gains. It was only in 1976 that tuition was first introduced at CUNY, mainly as part of the drive to roll back open admissions. Since open admissions was ended in 1999 efforts have only escalated to drive us out. They would rather have us remain disposable workers, struggling to survive off the meager salaries we make as people without a college education. Their idea is that most of us are fit only to flip burgers or sign up for the military to kill and die for colonial conquest. The CUNY Internationalist Clubs were born from the struggle to stop the “anti-immigrant war purge” that was launched in Fall 2001 when the CUNY administration used 9/11 as a pretext for more than doubling tuition for “undocumented” students. Protest and exposure largely succeeded in rolling back that attack, and today we need to stop the drive to price CUNY out of reach of those it was supposedly set up to serve.